Bridging images by Bridget Strevens-Marzo: Tiz and Ott's Big Draw in the USA, Culturetheque book of the week, and it's all about character and mark making! 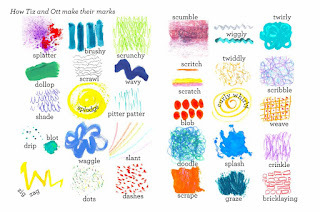 Tiz and Ott's Big Draw in the USA, Culturetheque book of the week, and it's all about character and mark making! Big news this week! My latest book, Tiz and Ott's Big Draw (out earlier this year with Tate Publishing UK) hits US shelves via Abrams Books - here- and already it has earned a Kirkus Star review! I can't wait to cross the pond next year to get drawing with kids in schools and bookstores there. 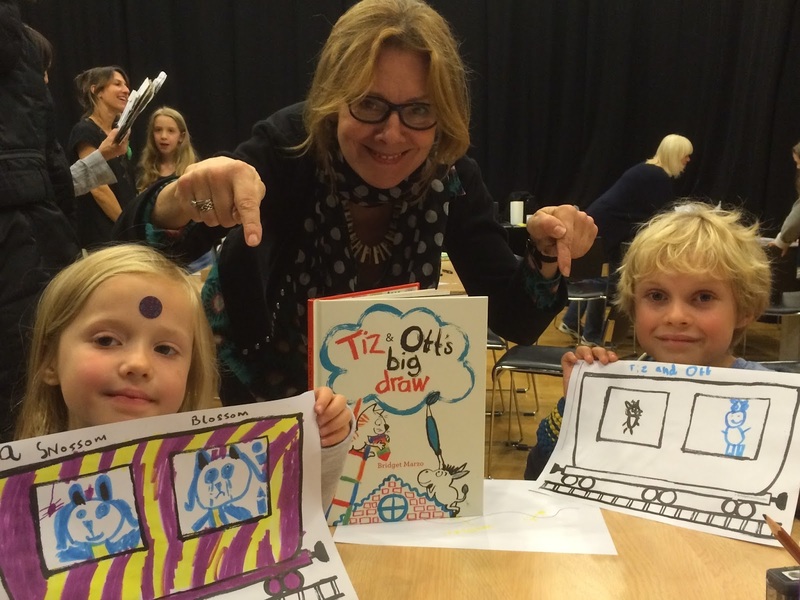 This week too, Tiz and Ott's Big Draw is also the London Culturetheque 'children's book of the week' - wow! 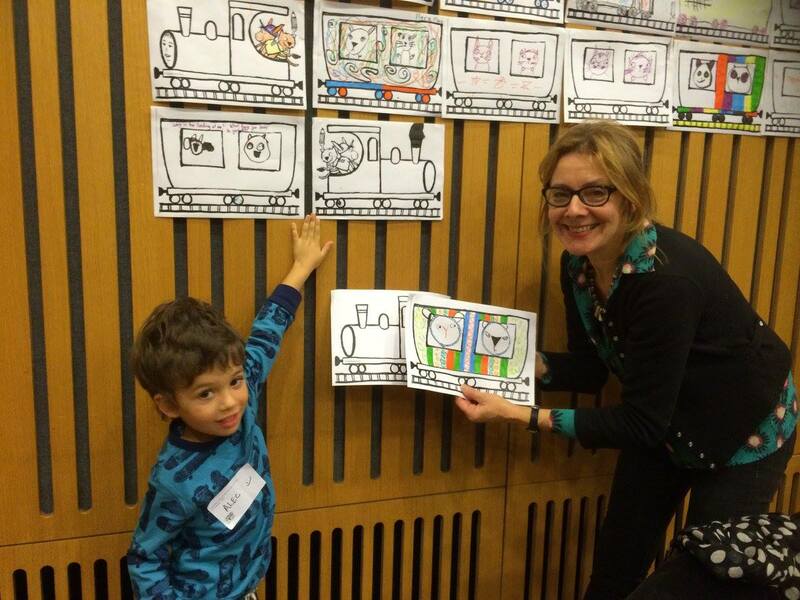 Next week I'm looking forward to South Ken Kids events and school workshops in London. 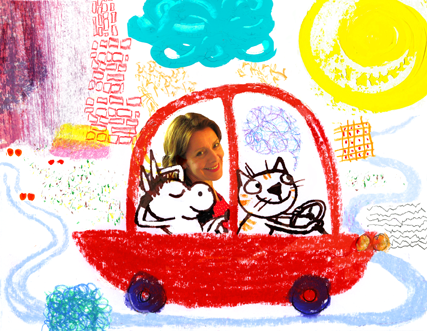 If you are in London on Saturday November 21, come and see me, Axel Scheffler, Beatrice Allemagna and other international illustrator-authors at the South Ken Kids Festival at the French Institute draw live on stage! 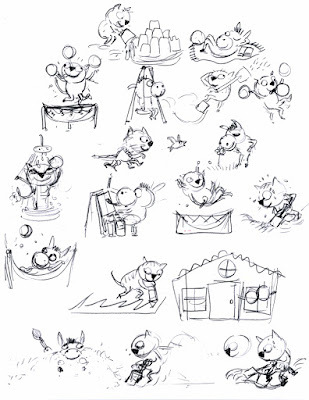 Busy Tiz draws, Ott likes to take his time and dabble with paint and they get carried away. What really matters is how they connect - and the story they make together. 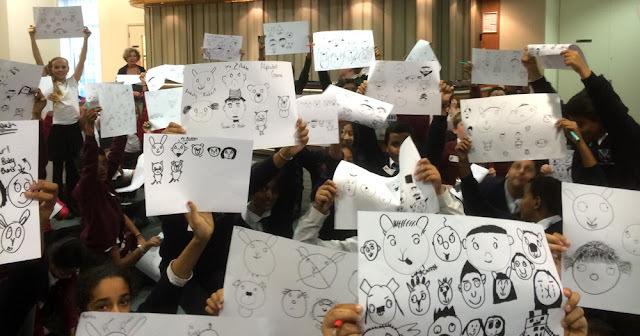 I wanted them to be simple and easy to draw so readers can focus on what THEY are drawing. 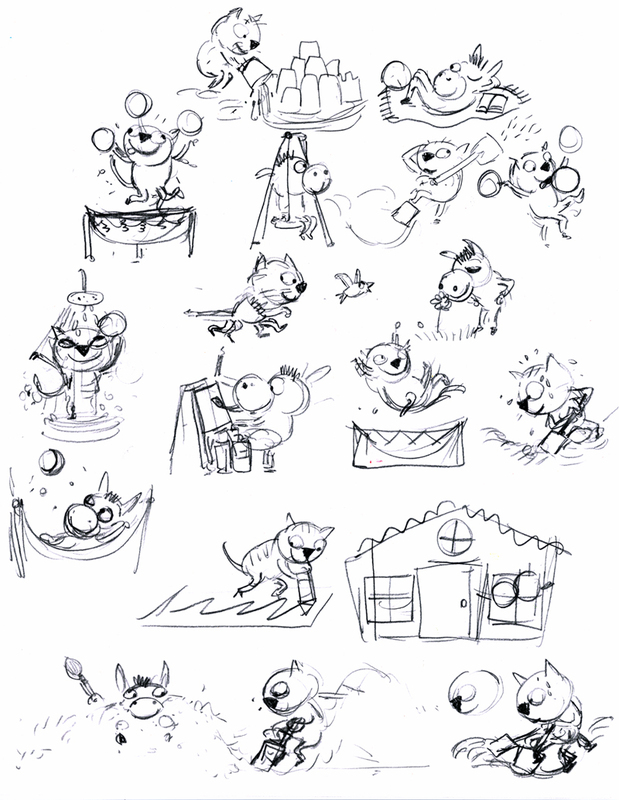 So before I wrote and illustrated Tiz and Ott's Big Draw I sketched Tiz and Ott obsessively. I got to know them well enough to simplfy them. Tiz and Ott are basically simple shapes. 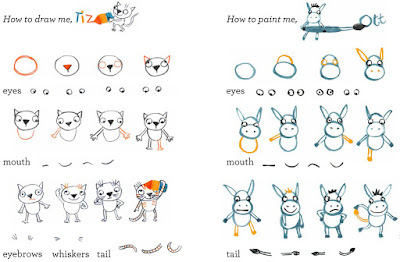 At the end of the book Tiz and Ott show you how to draw or paint them, step by step. In my story Tiz and Ott get stuck and in their very different ways, draw themselves out of their own creative block. 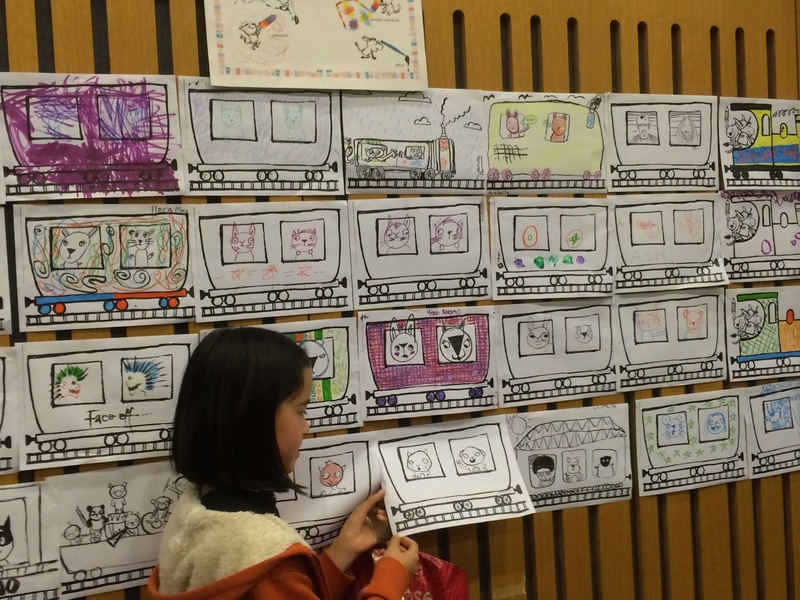 For many older chidlren the 'I can't draw' syndrome is a killer phrase for creativity. 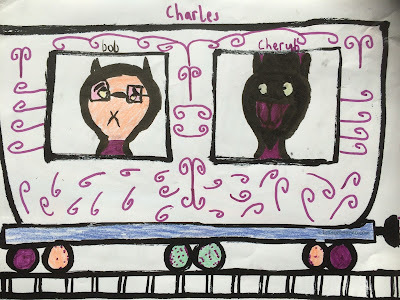 I often hear adults say it, and the damage often starts age 10 or so - with self-conscious comparisons to peers who CAN draw. I like to share a simple remedy for this. if you know how to write' capital letters O, U and V and I - and dots - you can draw simple characters. 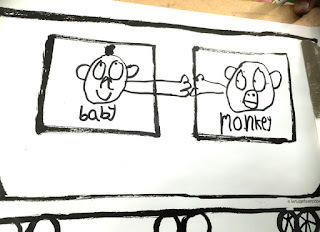 Adults are often the most inhibited about drawing, and at family workshops it's fun to see young children take the lead for once in encouraging their parents. I show how starting with big round O for a face, you can construct characters, placing letters within and around the face in different directions. 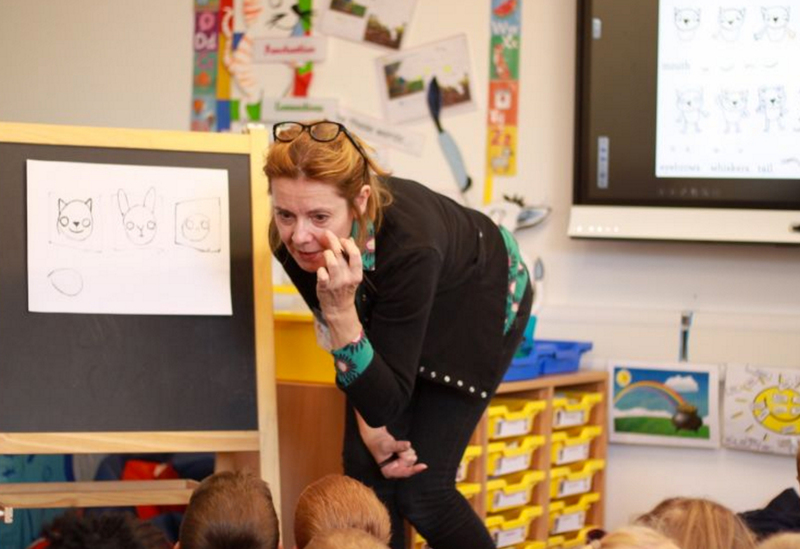 The fun bit is ending with the dot of the eyes, the pupils, placing them carefully in a chosen area of their round eye sockets. 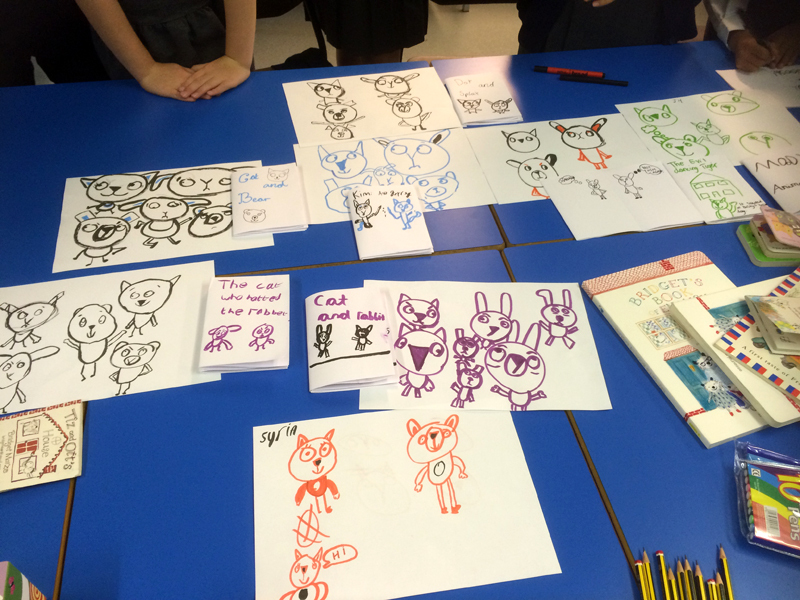 Looking at pupils - with pupils at the Pop Up Peterborough pilot at St John's School! If you save the dots - the pupils - to the end - it really feels like you are breathing life and drama into your character. Giving a direction to a gaze with a dot can be one way into a story. 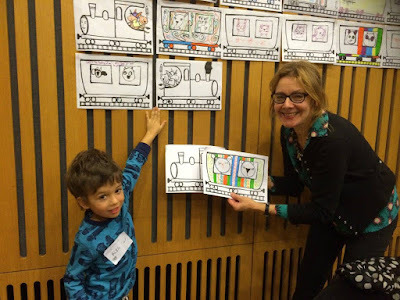 but Bob is not interested - "you can tell from how he's looking up..."
Using my quick draw recipe, my Big Draw October got rolling and literally on track at the Guardian Education Centre's Big Draw family day. 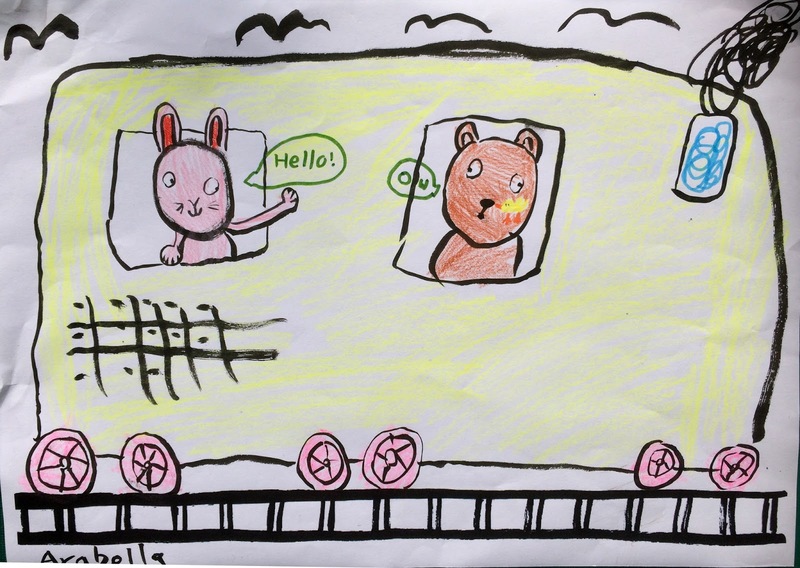 New families arrived every hour to draw characters to fill the windows of Tiz and Ott's train which grew and grew. 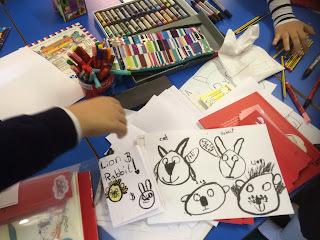 Sharing out some of my own favourite drawing gear including my favourite Pentel Brush Pens, children and adults created characters and 'graffited' the carriages with a range of marks inspired by Tiz and Ott's squiggles at the end of the book. 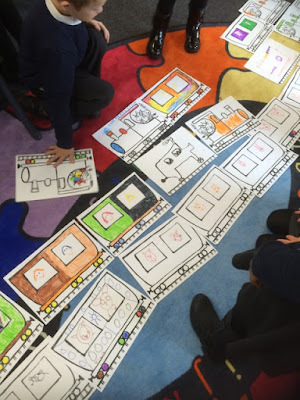 I asked the children as they finished, what were their characters thinking or saying? 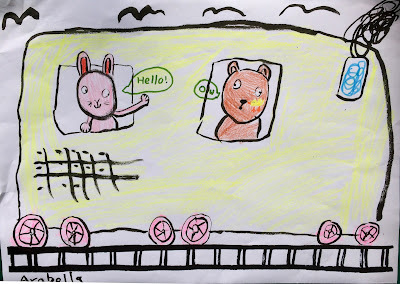 says hello and wants to meet him"
Tiz and Ott's whacky trains full of characters, grew and grew with drawings by children from 3 up, as well as by parents and grandparents. the final storm where Tiz and Ott get carried away. And Tiz and Ott's train travelled with me from London to the Isle of Wight then Peterborough. I love seeing how teachers work. 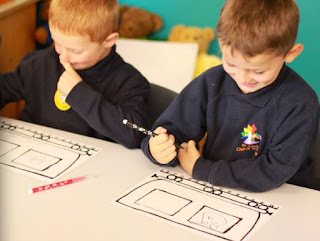 In different Peterborough classes teachers had used Tiz and Ott's story for all kinds of activities before I came - from story re-ordering to modelling a brick house, rainbows and mark-making. 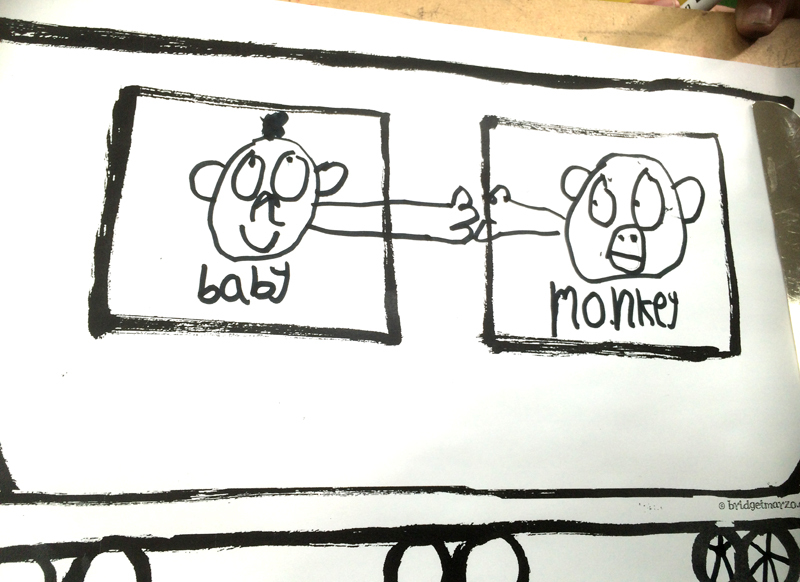 These two characters reaching out, made me laugh - monkey is clearly more interested in baby while baby focuses on what is on his head! 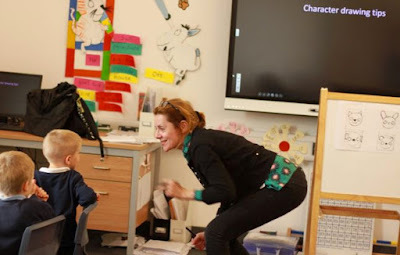 Longer intensive workshops with 8-9 year olds at Nineacres school at the Isle of Wight Literary Festival gave me time to help children use their characters as springboards for folded picture book stories. 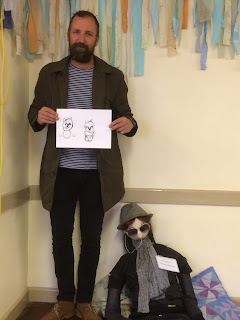 A big thank you the festival organizers, teachers and all the brilliant children at Nineacres, Gurnard and Northwood Schools for making me so welcome! 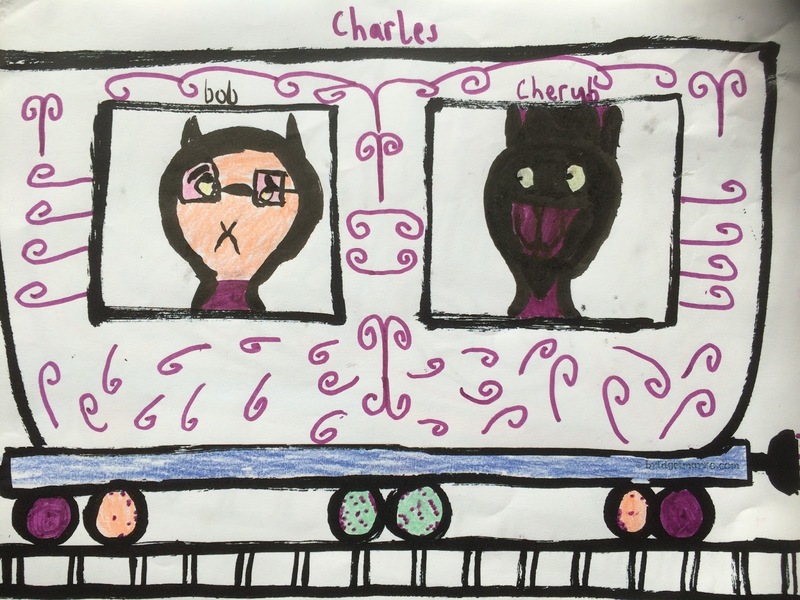 See here to read how a mixed group of 7 to 10 year olds too their animal characters further into stories for my 3 hour Chelsea Young Writers holiday workshop. 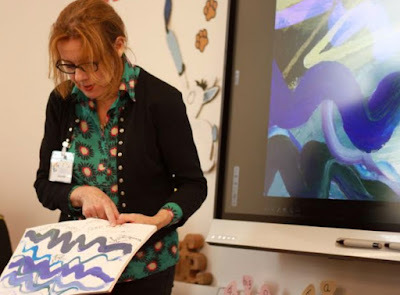 And there was a chance to use to Ott's favourite tools - paint and brushes to thanks librarian Rosemary Marchant at the Hillingdon Culture Bite family workshop in the happily thriving Ruislip Manor Library. After my quick draw character recipe we did mixed primary colours and white paint to create a huge variety of skin and fur colours. 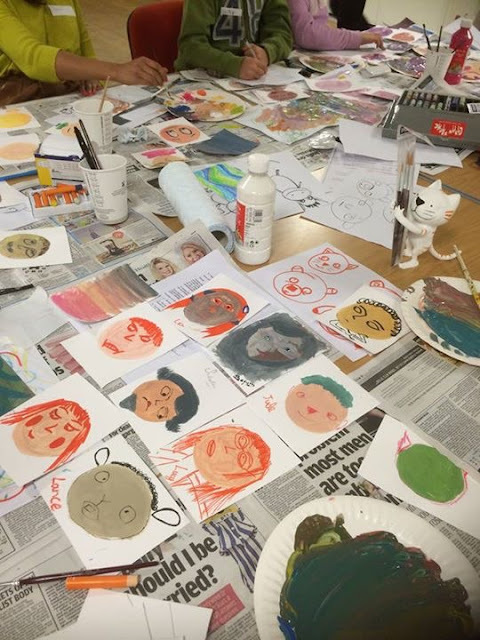 We had fun painting head shapes and then drew over or painted into the shapes to create another bunch of wierd and wonderful characters. What a fun crew we created! Can you see Tiz busy holding brushes in the midst of my Hillingdon Culture Bite workshop? More about the 3D printable 'Tiz pen and brush holder' soon! Last week these 'quick draw characters' were generated by over 70 8-11 year old children from several schools, their teachers - and a few fellow authors too - at my plenary illustration talk for CWISL's Shoutwest Festival at Brunel University. ©Bridget Strevens-Marzo. Simple theme. Powered by Blogger.